Heat olive oil over medium-high heat in a large stockpot. Add sausage and bacon. Cook until sausage has browned and bacon is crispy. Remove and set aside. Cook onion in bacon grease for about 5 minutes or until softened. Add tomatoes, chicken broth, black-eyed peas, dried thyme, red pepper flakes, salt, and pepper. Bring to a boil and then reduce heat to low. Cover partially. Simmer for about 20 minutes. 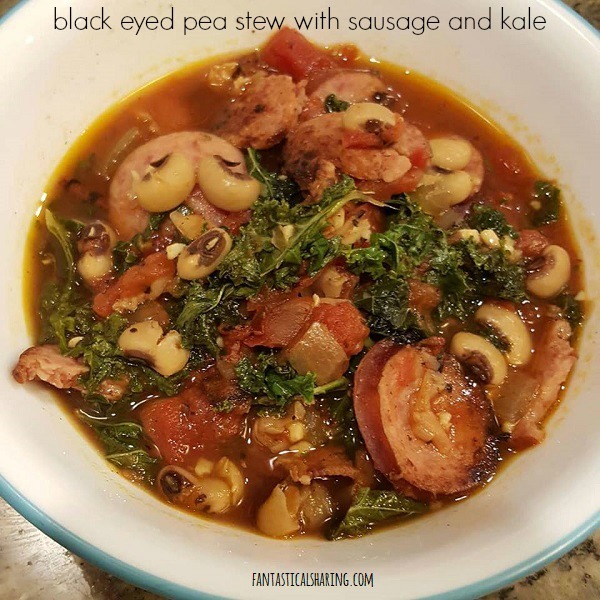 Add sausage and bacon back to the stockpot with kale and stir. Cook until kale is wilted. Serve. I apparently don't post many stew recipes, so here is one from 2014 that is The Best Beef Stew. For the most traditional way to eat black eyed peas for New Year's Day, check out this Hoppin' John recipe from Simply Recipes.